Posing for a photo in Capri, Italy, from left to right: Junior Aubree Daumit, senior and former Setonian editor Calli Arida, professor Jen Jones and junior and current Setonian editor Paige Parise. Photo courtesy of P.Parise/Setonian. For many students at Seton Hill University, including myself, our first taste of summer was flying across the Atlantic Ocean to spend time in Europe. Traveling to Italy has always been an aspiration of mine, so when the opportunity arose, I jumped at the chance to study abroad there. 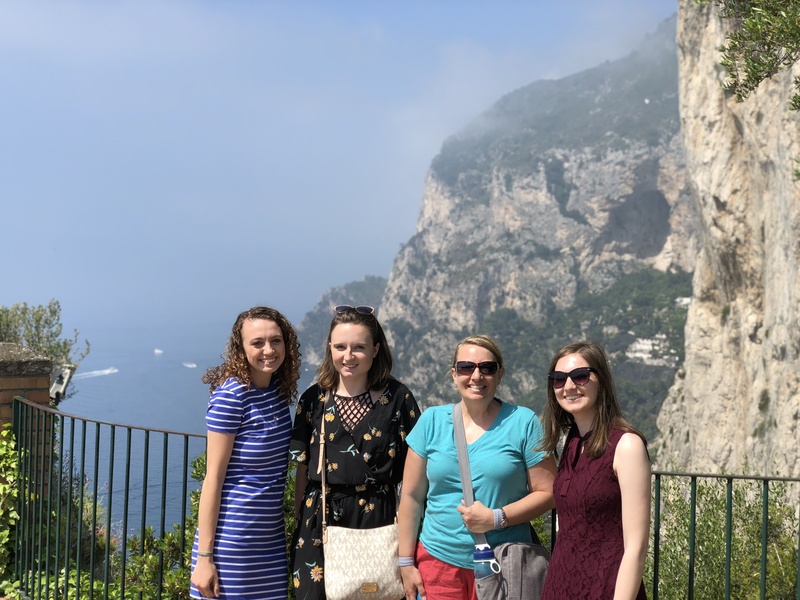 Along with Doreen Tracy, assistant professor of dietetics, and Jen Jones, associate professor of communication, our group of students traveled to Italy from May 16-27 and visited Venice, Florence and Rome. Students who attended this trip received course credit for the western cultures and/or philosophy requirements of the SHU liberal arts curriculum. In each city, we had walking tours by local guides who explained the history of their particular cities and important landmarks and monuments, such as the Colosseum in Rome. We were also given time to explore certain places on our own, like the Doge’s Palace in Venice and the Accademia in Florence (home to the famous David statue). While the walking tours were a beneficial way to learn the history of Italy’s cities, having free time was also a valuable way to learn about the country’s culture and discover places on our own. Everyone in our group learned something different and experienced different aspects of the country’s culture. 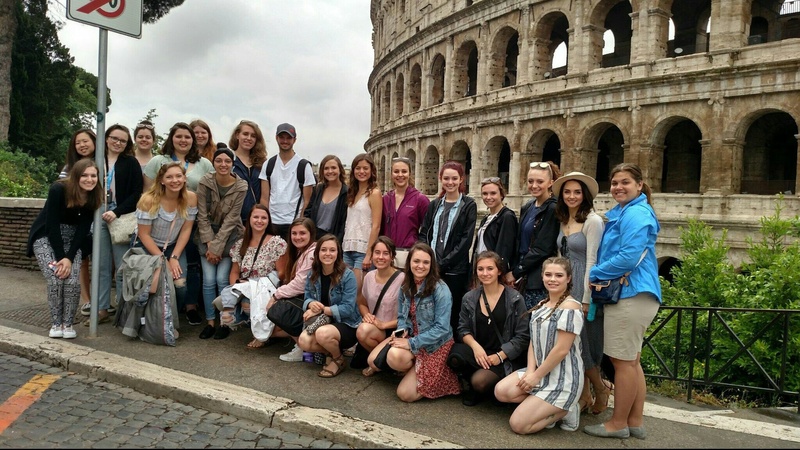 Seton Hill University students pose for a photo in front of the Colosseum in Rome during their study abroad trip to Italy in May. Photo courtesy of P.Parise/Setonian. In addition to the larger cities, we traveled to the countryside in Tuscany to tour a winery, and some students traveled to see the Leaning Tower of Pisa. We also made a stop in Assisi, where we toured the Basilica of St. Francis, and went on a guided tour of Vatican City during our stay in Rome. Our group was led by Valentina, who was born and raised in Italy and serves as a tour guide with EF Education First, a company that provides educational tours for schools around the world. In addition to making sure our trip was running smoothly, she frequently discussed different aspects of her country and her experiences as an Italian citizen. Having the opportunity to interact with an Italian citizen on a daily basis was a great way for us to learn about daily life in the country. Many students in our group also chose to go on a two-day extension to travel to southern Italy. While each of the places we visited had tourists like the other cities, the south was a unique experience. 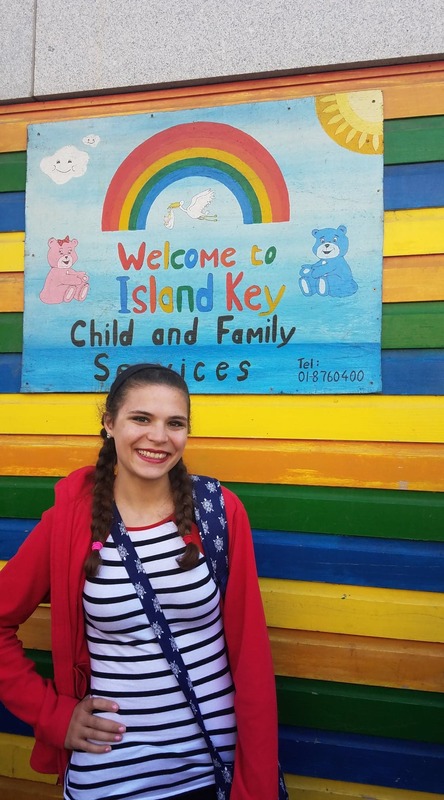 Junior education major Laura Kerestes poses for a photo in front of the Early Childhood Ireland building during her study abroad trip to Ireland in May. Students who attended the trip learned about the school systems of Ireland and England. Photo courtesy of L.Kerestes. We first toured the ruins of Pompeii and saw firsthand the place that many of us learned about at some point growing up, which seems much bigger in person. Our group also visited Capri, and everyone in our group was blown away by the natural beauty of the island. From Venice in the north to Capri in the south, studying abroad allowed us to experience many individual places that make up the collective culture of Italy. Each city in Italy is unique in its own way, and having the opportunity to visit many places gave me a deeper understanding of the country as a whole. Italy wasn’t the only country in Europe where students studied abroad this May. Another group of students traveled to Ireland as part of their multicultural practicum with Kathleen Harris, associate professor of education. On this trip, students learned the similarities and differences of Ireland and England’s school system in comparison to America’s. The trip to Ireland took place from May 15-25, and the students visited Dublin, Galway and Belfast. 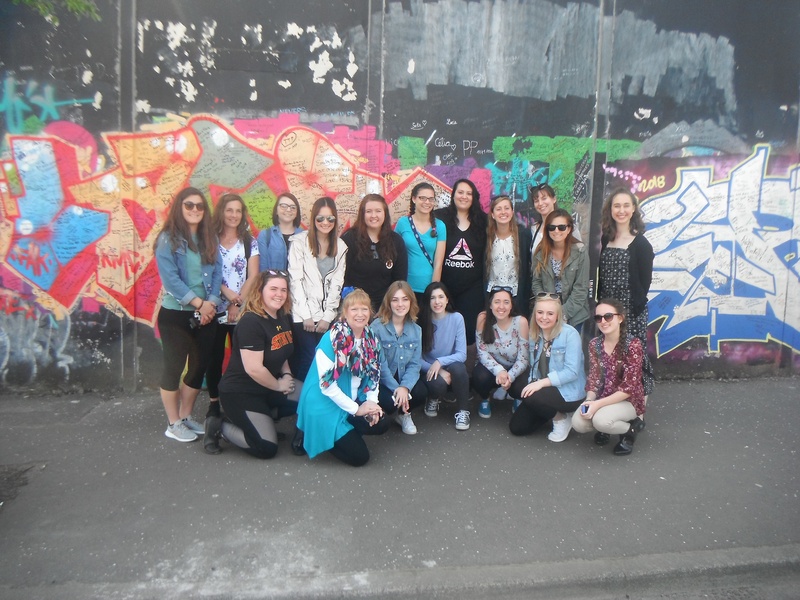 Along with visiting prominent areas in Ireland such as the Dublin Castle, St. Patrick’s Cathedral and the peace wall in Belfast, the students visited various educational institutions, including Trinity College, the College of Dublin and Early Childhood Ireland. In addition to Ireland, the students traveled to England to visit the city of London, where they saw landmarks such as Buckingham Palace, the Tower of London and Big Ben, and they visited the Christ Church Primary School. Seton Hill University students and professor Kathleen Harris smile for a picture in front of the peace wall in Belfast, Ireland. Harris and her group of students traveled to multiple cities in Ireland and London, England during their study abroad trip in May. Photo courtesy of L.Kerestes. Kerestes said she believes studying abroad is a “valuable way to learn about different cultures” and that it’s important to be open to the differences among cultures to learn and solve global issues.